Well I guess you can call this a small group outing since only three rigs and six people were able to make it this weekend. My son Nicholas and I left Modesto at 6:30 this morning and made it to Hollister Hills just before 9:30 after stopping for breakfast along the way. When we pulled into the parking and picnic area I could not believer what I saw! A group of young kids (late teens-early 20GÇÖs) had a sofa bed and sleeping bags by a campfire pit. Never in my life have I seen a sofa bed show up at a campout. I use the term Y.A.D. and I think this falls into that category. Y.A.D. stands for Young And Dump! I parked at the picnic table at the top of the stair step. As I was airing down my tires in the Toyota Nicholas climbed into the back of the Blazer to get some more sleep. (He went to the movies Friday night and did not come home and go to bed until 2:30). 6:00 came real early for him this morning! Chuck and his daughter came rolling in right just I finished airing down. Well it was now shortly after 10 and it was just Chuck and myself. We decided just to drive into the OGÇÖcourse and hang out there for a while. As soon as we pulled in we saw a father and son stuck in the Mud Pit so we went to help out. I ask the kid if he had a tow strap and would they like us to help pull them out. Of course he and his dad said ya and then they pulled out a motorcycle tie down strap. Ya right! The whole front end of his Cherokee was berried in that sticky mud. Chuck backed his rig into possession and pulled out his tow strap. Just as we were giving the kid the last tug out when Darell pulled up with his Bronco still on the trailer. Darell led us on a very nice morning run. Chuck and I marked our rigs in the very same spot going through one spot Darell led us through. Chuck dropped down into this one whole and kissed a rock and left some green paint on it and I followed. This time I kissed the rock and picked up Chucks green paint on my yellow fender. Darrel led us through parts of the park that I have never gone through before and it was very fun. Well it nearing lunchtime now and Darell comes over the radio and says IGÇÖm going down this one trail and IGÇÖll let you know if itGÇÖs passable. Cathy came back a minute later and says GÇ£Piece of CakeGÇ¥ so Chuck and I follow with Chuck in front. The next thing I see is the front of Chuck Jeep sliding left and the up go the right side wheels. Well they did go up. All the way up! All I could think of was Cathy saying GÇ£Piece of CakeGÇ¥ while I started laughing. Chuck and his daughter were very quit inside. Darell and I were checking this out. 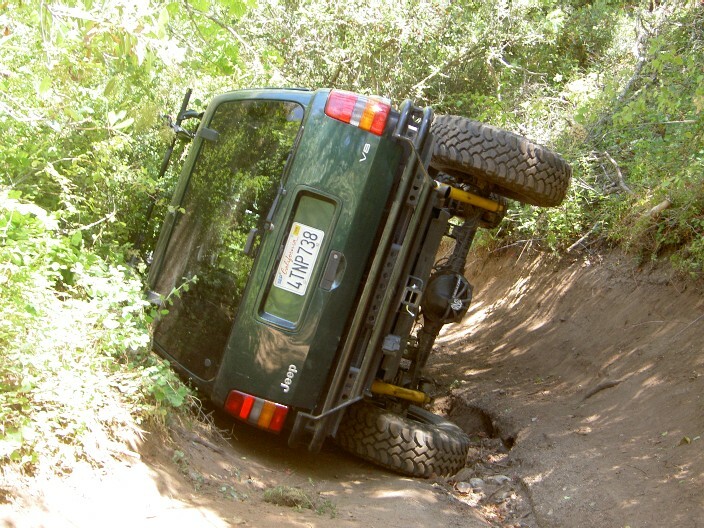 We were not able to push him back over so I guess it was winch time. Chuck was just talking earlier this morning that he had never used his winch. He should not have said that! Darell gave me a lesson on how to winch someone out. I was the one that went through the brush (most likely poison oak) to hook up the tree saver and run the cable. 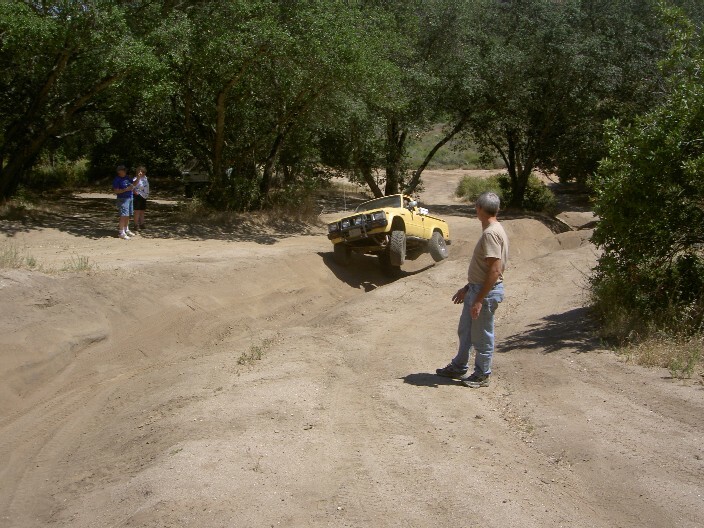 Darell took the winch control and had Chuck start his engine and turn the steering and started pulling. I was amazed on how easy Jeep came down on all four wheels and Chuck was even more amazed the he only had a few scratches in his rear quarter panel. It was now lunchtime so we drove back to the OGÇÖcourse to break for lunch. After lunch Darell took the lead again. He led us on a very soft and rocky trail all the way to the top, one of the highest parts of the park. We got out of our rigs to check out the view, the city of Hollister and the surround hills. On the way back down we stopped at the ravine. I told Darell I have never had the chance to run up the whole thing so now was my chance. First time up was a piece of cake! On my second pass up I see Darell holding up a tape measure. I guess my one wheels was about 3 feet up in the air. Chuck followed with no problem. We then drove back to the parking area to call it a day. Thanks Darell and Chuck I had a great time!